I still don’t really get why they celebrate Christmas in Idenau, but Merry Christmas! Merry Christmas/whatever and Happy New Year (we all celebrate that one, right?) from me and Victor to you! We truly appreciate every single person who reads our comic. So I really do wish that you all have a magical time celebrating with family and friends. Thanks for sticking with us; your comments and smiles have already given us a wonderful gift, the gift of being able to share a story to people who will listen, to create a world and have people care. Thank you! The art looks especially nice! Thanks. I enjoy getting to actually shade things here and there. Oh, Slice, you. Maybe next time, if you’re not all clammed up like that. I just noticed that the antler on Dirk’s head. It has a How the Grinch Stole Christmas feel. Yeah, that was the idea. Skärva is stealing Christmas, and Derk is his Max and Lorelei is Cindy Lou Who. It’s subtle but it fits really well. I was so confused for a few minutes. I kept looking at the comic strip, but couldn’t see Derk at all, much less antlers. Then you said Skarva and Lorelei and then I got even more confused! …and the obvious struck. Merry Christmas, PJ and Victor! 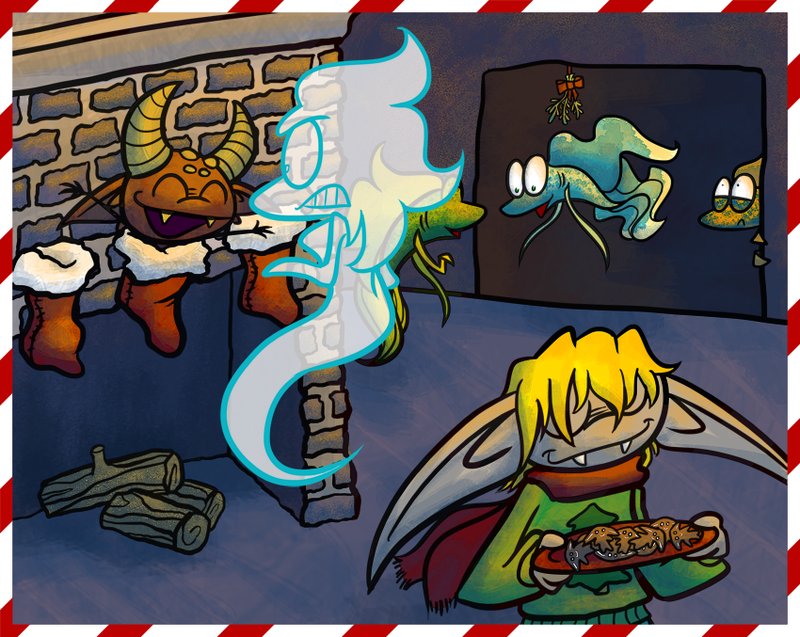 The card is lovely, and I love the banner – although the former is making me hungry for gingerbread lurkins! Happy Christmas and a Merry New Year to you too! Aw, the cookies! Aaw, Slice! Aw Everything! What a really sweet card! I feel bad I didn’t make one this year. Q: Why do they celebrate Christmas in Idenau? A merry Christmas to you both, and I hope to be able to make something even half as awesome someday. I enjoy this comic greatly and it’s the only/first one I’ve commented on regularly. (other’s I might have posted like once or twice but I feel like i’m saying something at least every other comic now here). Also considering earth has like 4-5 winter festivals alone, I’m sure Idenau would have at least one, and there have been stranger places to have christmas-likes. EXACTLY. Winter is a cold time so it’s perfect for celebrating the blessings that you do have, like the existence of cookies! Dang Floyd, flaunting the ears this christmas, huh? Excellent cookies. If I had ears like that I would flaunt them too!